Patagonia is a huge name in outerwear. We’re not just wearing our Patagonia pieces out in the wilderness, though. As the brand’s popularity continues to rapidly grow, we’re seeing the styles worn more and more, no matter where we are. Celebrities are especially inspiring us lately, and we just had to find this fabulous fleece when we spotted it on one of our favorite supermodels. Patagonia’s Synchilla Snap-T Fleece Pullover is an impeccable mix of outerwear, fashion and coziness. While it would obviously be our first choice for a camping trip or chilly hike, Kendall Jenner proved that it’s also a go-to for indoor activities, such as the basketball game she wore hers to! She rocked it so hard that this fleece is selling out fast in multiple shades, so let’s get into it! 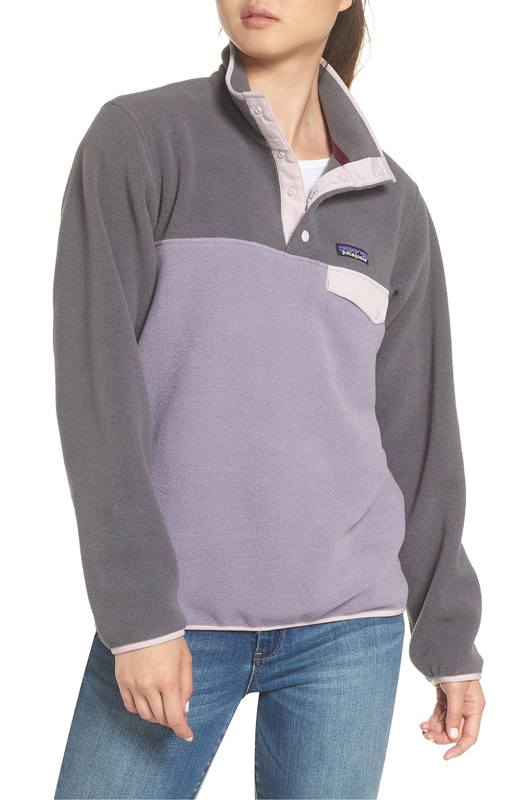 See it: Get the Patagonia Synchilla Snap-T Fleece Pullover for $119 at Nordstrom! This fleece pullover is synonymous with softness. The fleece is on both the outside as well as the inside, making it extra warm and comfortable. It has a slightly oversized fit, with wide sleeves for ease of moment and major layering potential. We love a good oversized pullover. Not only is it cute (duh), but if we’re having a rough day or can’t quite deal with high-waisted pants digging into our stomachs, we can just throw this on and no one will ever know. It might help us feel better, too. 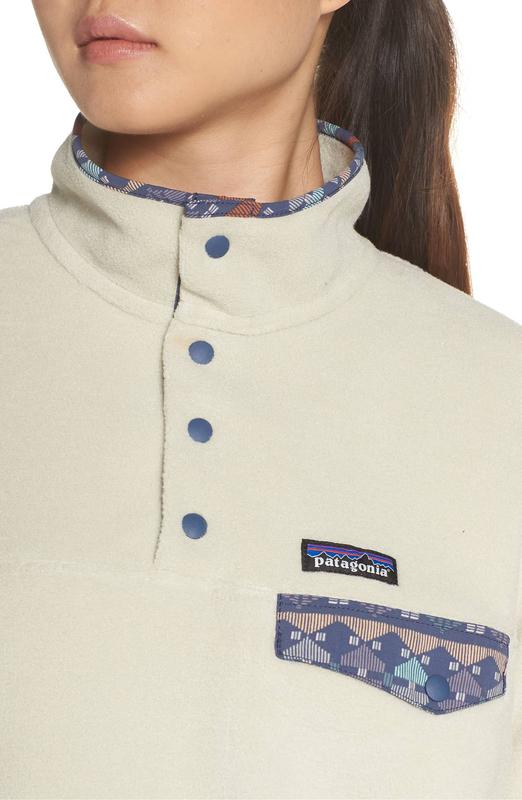 This fleece has Patagonia’s signature nylon Snap-T chest pocket, as well as a four-button stand collar. These features elevate this fleece in just a couple of snaps, literally! Just above the chest pocket is Patagonia’s logo, which we’d recognize anywhere. We love the chest pocket and collar as features, period, but we’re going to take it to the next level when we get into the different colors and patterns available. Okay, fine, we’ll do it now! No, we insist. The Arrow Red shade is a deeper, almost berry red. The Snap-T pocket and collar lining, though, are a mix of oranges, yellows, whites, stripes and shapes, creating diamonds, hexagons, squares and even stripes. This detailing sets this fleece apart from any old fleece. Of course, so does the top-of-the-line quality and construction! If we want something more muted, we can also choose the all-black option, which leaves the patterns at home for another day. The fleece is black, the pocket is black and yes, the buttons are black too! The only slight hint of color is from the Patagonia logo itself, which is a must so people know that we dress the same as supermodels! Calcium, which is almost sold out, is a mix of gray, beige and black. A neutral to go with all neutrals! Pelican With Stone Blue is a lovely cream color that brings the patterned pocket and collar lining back into play. The buttons are a soft blue, which is reflected in the patterned detailing, along with purple, a yellow-orange and a minty blue for a very understated early ’90s vibe. Also selling out quickly is Smokey Violet, which is a mix of a lavender purple and medium gray. The pocket and lining are a pinkish off-white. It’s clearly inspired by the comfort and functionality of menswear, but with a touch of femininity, and we want more of it! Shoppers are more impressed by the versatility of this fleece by the day. One said they wear it everywhere, including on errand runs, dog walks, in class and to the gym. We don’t have too many pieces in our closet we’d wear to everything like that, at least not if we wanted to look good. Another shopper commented on how it’s “comfortable by itself or over a thin under-layer.” We love that we can wear this fleece on its own. It’s such an easy outfit choice to pair it with some skinny jeans, so why should we have to worry about also picking out a shirt to wear underneath? If we do want to layer for an extra cold day, or if we’re headed to an overly-heated office, that is, of course, no problem. One shopper specifically loved how it’s “roomy enough to layer but not frumpy,” which can be a huge issue with layering in general. Apart from skinny jeans, we obviously would pair this pullover with leggings if we were doing an athletic activity, or even the polar opposite and just chilling out for hours (and hours) on end. No matter what bottoms we spring for, we know we can slip on a bootie or even a knee-high and we’ll be set! We need to hurry and make sure we get the shades we want before everything sells out! The supermodel effect is real, especially when it comes with free shipping! See it: Get the Patagonia Synchilla Snap-T Fleece Pullover for $119 at Nordstrom! Not your style? Check out other jackets and coats from Nordstrom here!